Congratulations!! Please hit up my G-Mail (nobel4lit2) with your mailing address, and we'll get the book shipped over to ya! 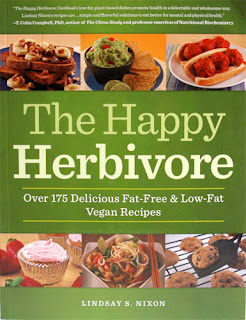 Here's another installment of my cooking adventures from The Happy Herbivore cookbook! If you missed my interview with the author, click HERE to read it! 1) While it's good to make vegan comfort food, it can get you into the habit of eating comfort food. This isn't bad if you have access to these versions all the time, but if not, watch out! 2) You have to love food in its own merits and stop making comparisons. Take these black bean brownies, for example. People might judge how good it is based on how close it tastes to a "real" brownie, which I guess means sugar+butter+eggs. 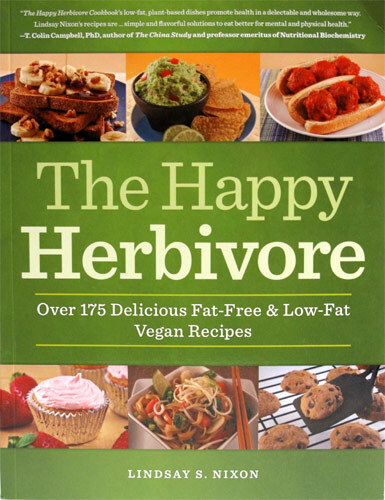 No, these Happy Herbivore brownies are good in their own right -- they actually taste exotic. The reason I fretted over these is because I was expecting something close to my vegan brownies, which people request from me all the time because they are admittedly THAT good. So when I took out these black bean versions, I wanted to hide them. But while I was watching TV downstairs, I suddenly heard a loud "Mmmm!" from the kitchen. "The Ukrainian" walked out holding one of these brownies and told me that they are good -- like an exotic dessert. I love him for having such an open mind. The next morning, I had a small bite and realized that they WERE good. Not brownies, but good. 3) Improvise. Cookbooks are not the end-all, be-all. ;) I made this soy-free mac n cheese and found it not to be even close to what I'm used to. It is slightly closer than this other version I made, but it isn't cheesy enough to be mac 'n cheese. But that's okay, because I had just wanted to make some kind of cheese-ish sauce to douse vegetables in, and by mixing in some frozen broccoli into here, I am able to see that this is indeed possible. Not being a huge pasta eater, I will probably make a predominantly-veggie version next time. 4) Leave a comment about a recipe you'd like to see vegan-ized. I would really love to win this, I already follow your blog on my rss reader! A dish I'd like to see veganized is a delicious banana bread! i follow :) i thought i already did...but apparently not.. I was going to say pot pie, but then saw that was one of suggested pages below today's post. The other night that is what I wanted. I grew up eating pot pies. There is something about food we ate during childhood that is familiar and comforting. I'm sure I already follow you!! mmmmthat pasta thing looks good. I'm also not a huge pasta person so post a veg recipe and I'll try it! I'd love to see a triple layer vegan cake or something decadent and dinnery veganized. Something that is typically creamy but made healthy. I am a follower. Tadaa! And as for a food I'd like to see veganized -- DIY beef jerky. I know you can buy veg. jerky but I wanna make it myself! I'd be interested in more vegan snacks. The only thing I come up with on my own is PB or hummus on veggies and crackers. Boring. i'd love to see any mexican food vegan-ized...cause i'm all about the cheesy taste!